In 2017, Fort Lee, Virginia celebrated its centennial-one hundred years of serving America and operating in the Tri-Cities area of Virginia. Fort Lee is located near Petersburg, Hopewell, and Colonial Heights. The post has a daytime population of well over 27 thousand and trains more than 70 thousand soldiers annually, serving as one of the largest training sites operated by the United States Army. Fort Lee is home to the Army Ordnance School, Quartermaster School, Transportation School, and Army Logistics University. 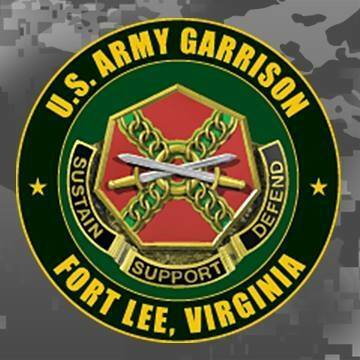 Find information about Fort Lee, Virginia, including the main commercial and DSN numbers for the base, information on basic services, base transportation, lodging for TDY and PSCing personnel, and inprocessing. Not long after the United States declared war on Germany in 1917, the War Department purchased a large amount of farmland in Prince George County, Virginia and the start of what was then known as Camp Lee began. 15 miles of road and thousands of buildings later, Troops from Pennsylvania, West Virginia, and the local area began arriving at the camp for training; ultimately more than 60 thousand troops would pass through Camp Lee on the way to World War One. Once the war ended, Camp Lee would focus on out processing troops leaving the service, and later the Camp would close altogether. It wasn’t until World War Two and the passage of the Selective Service Act that Camp Lee would reopen; there was much to do since all but a single original structure built on Camp Lee the first time had been torn down. The new Camp Lee had more than 350 thousand troops pass through on the way to combat. After World War Two ended, the camp did not close, but instead continued to operate as a training center for the Women’s Army Corps and the home of the Adjutant General School and the Army Quartermaster School. In the 1950s the Army decided to finally make the installation permanent and Camp Lee became Fort Lee. Today’s Fort Lee is still an important training base; Army Logistics University came to the Fort in 2009 and the U.S. Army Ordnance Corps Ordnance Campus are just two of the modern operations that prepare soldiers for their role in national security and overseas operations. 2017 marked the 100th anniversary of Fort Lee. There are plenty of things to do in and around the Fort Lee area; history buffs should visit the Petersburg National Battlefield, a Civil War historical site. Pocahontas State Park is a place fans of the outdoors should experience along with the Chester-located Point Of Rocks Park, which is known for its nature trails in addition to the more typical public park attractions including a playground, intramural spots, etc. Those looking for a family-oriented outing should visit the King’s Dominion amusement park, the Edgar Allen Poe museum, or take a two hour drive from the Fort Lee area to explore the nation’s captial-Washington D.C. has much to offer including the Smithsonian, the Vietnam War Memorial, the White House, etc. Richmond, Virginia is also a short drive from Fort Lee and includes a NASCAR speedway and the John Marshall house among many other attractions. Check-in procedures into Fort Lee will vary depending on whether the military member is permanent party, going through AIT, attending schools on-post, or otherwise on temporary duty. The Soldier Support Center (SSC) is where permanent party Army personnel reporting to Fort Lee must go during regular duty hours. After duty hours, permanent party military members should report to the Installation Operations Center. Air Force members should check with at the 345th Training Squadron, Navy personnel Report to the Naval Detachment, and Marines will report to Report to the USMC Detachment. The Fort Lee official site says students, including those headed for the Combined Logistics Captains Career Course (CLC3), Basic Officer Leaders Course (BOLC), Warrant Officer Basic or Advanced Course, Advanced Leader Course (ALC), Senior Leader Course (SLC), and international students must report to the 71st Student Battalion at Army Logistics University. AIT and MOS-T students arriving at Fort Lee via privately owned vehicles must report in uniform no later than 2PM Fridays. Students reporting to Ordnance School (Ordnance AIT/TDY/MOS-T Students, 59th Ordnance Brigade) are required to check in with the Ordnance Campus. Fort Lee is served by Kenner Army Health Clinic, which is responsible for outpatient care; Kenner refers patients who need services above and beyond outpatient treatment to a local network healthcare provider. Sick call services are available for active duty military members. Make an appointment for outpatient services by calling 1-866-LEE-KAHC (533-5242); After duty hours call the “Nurse Advice Line” at 1-800-TRICARE, option 1. Fort Lee child care on-post is provided by post Child Development Centers (CDCs, offering fully accredited child care programs for part-time, full-time, and hourly care. Full and part-day programs are for children ages six weeks to five years old. Part-day programs are not for children attending Kindergarten. Respite care is also available for families of deployed, TDY, unaccompanied, and wounded soldiers. To be eligible for CDC care, the child must be a family member of active duty military personnel, DoD civilians, or DoD contractors. All children must be registered through the Child Youth and School Service (CYSS) registration office; call 804-765-3852 or DSN 312-539-3852 for more information. There is a waiting list for on-base child care; the military member’s rank, status on the base as permanent party or TDY personnel and other factors may determine the duration of the wait list times for an individual applicant. Fees for on-base child care are income based and CDC child care options are not a military entitlement or benefit. In-home family child care options are also available on-post. This care is available from private homes on Fort Lee and care providers must meet certification and inspection standards. All personnel who need replacement Common Access Cards, dependent IDs, retiree ID cards, etc. are directed to use the RAPIDS appointment system to scheduled appointment at the Fort Lee Identification and DEERS office or call 804-734-7394 for more information. Walk-in service is available but waiting times can run between 30 minutes to two hours. For dependent ID cards, the sponsor must be present to complete/sign DD Form 1172-2 or the dependent must have a previously signed DD 1172-2 which is permitted within 90 days of signature. All PCSing military members with household goods shipments en route to Fort Lee are directed to track and manage their household goods shipments via the Defense Personal Property System at Move.mil. Questions and appointments can be made via the Fort Lee Transportation Office (inbound) at 804-734-4187 or DSN 312-687-4187. Contact the Fort Lee School Liaison Officer to get help with schools and school district options by phone at (804)765-3813. Housing at Fort Lee is privatized and managed by Fort Lee Hunt Companies. All PCSing military members are required to check in with the Housing Services Office in the Soldier Support Center; those who need permissive TDY for house hunting must check in on the first day of the TDY with orders to receive a “housing stamp” verifying the permissive TDY. In cases where this the proper procedures are not followed, the service member will be charged leave rather than be considered on TDY status. Fort Lee has a variety of separate neighborhoods to choose from, but there may be a waiting list depending on TDY/PCS season, the number of incoming troops, and other variables. Qualifying single E5s and below may be eligible to live in unaccompanied housing via the First Sergeant’s Barracks Program 2020; learn more by calling 804-734-6177. Soldiers who are geographically separated from family are not eligible for unaccompanied housing; All soldiers E6 and above without dependents are required to live off post. Those TDY or PCSing to Fort Lee, Virginia are directed to make booking arrangements via the IHG Army Hotels official site for the Fort Lee Lodge. Transportation from Richmond International Airport is available for soldiers attending Advanced Individual Training (AIT). The Fort Lee official site says this option is available at no cost (as long as the soldier has military orders) from James River Transportation: (804) 249-1052. There is also an Airport Taxi service authorized to operate on post, available by phone at (804) 222-6666. The Petersburg Area Transit operates buses on Fort Lee to and from the installation to Petersburg with connections to the surrounding communities. The bus stop may be found outside the Fort Lee PXtra on Mahone Ave.
For soldiers attending one of Fort Lee’s many training facilities, on-post shuttle services are available with around 20 stops and bus pickups once every 25 minutes. Using the on-post shuttle requires a valid DoD ID card and the busses operate on a space available basis only. Fort Lee no longer requires base decals for privately owned vehicles to access the post. A Common Access Card is required to enter the base; those who do not have one will be required to submit to a background check at the Fort Lee Visitor Center before entry to the post may be approved. Motorcycle operators may be required to furnish proof of completion of the Motorcycle Safety Foundation Experienced Rider Course; this is a free class held at Fort Lee by volunteers who work with the Installation Safety Office. All drivers entering Fort Lee are required to observe traffic restrictions on the post’s official physical training route; these restrictions are effective between 5AM and 7:30 AM weekdays. The training restrictions include a complete closure of Shop Road from the Main Post Exchange to the Quartermaster Museum. During this time there is also no traffic permitted for the entirety of B Avenue. These areas are considered “Prohibited routes” and are marked with cones and signs during the traffic restrictions.